White kitchen cabinets remain massively popular among home remodelers, and rightfully so. When it comes to aesthetics and versatility, white kitchen cabinets almost always take the cake. Nowadays, most people desire a more modern or contemporary style to accommodate their white cabinets, but these cabinets can also be a great foundation for traditional kitchen styles. While some people may feel like traditional kitchens are too outdated for today’s tastes, their intricate and detailed designs have proven to be able to last the test of time. The great thing about using white kitchen cabinets in traditional kitchens is that they help to somewhat modernize the design by brightening up the space, making it feel more warmer and more inviting than the usual dark, traditional kitchens. Because traditional kitchens usually require more design elements, there are more opportunities to truly personalize your traditional kitchen. Not all traditional kitchens are the same, and with the right design choices, you can create a kitchen that’s a perfect reflection of your personality. 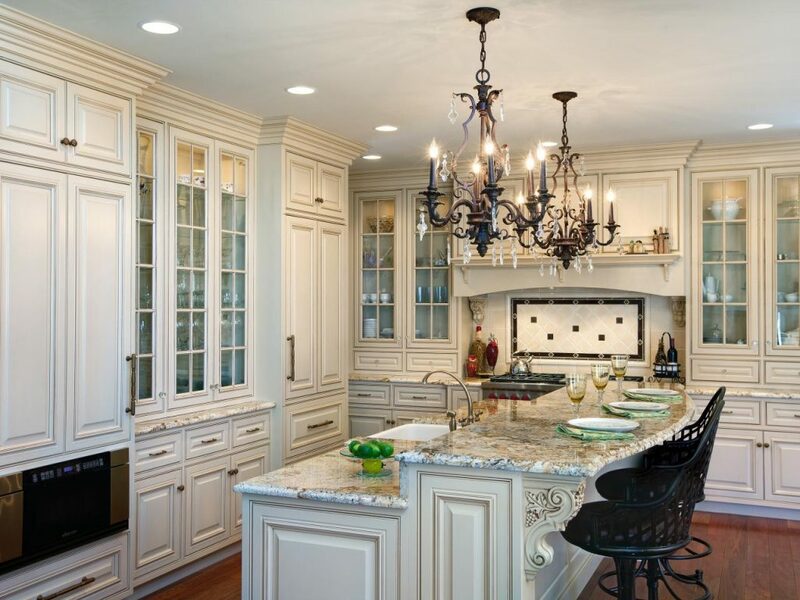 Here are a few white traditional kitchens to use as inspiration for your next kitchen remodel. Create your traditional kitchen with our Gramercy White kitchen cabinets and accessories! The first thing you’ll notice about this traditional white kitchen is that it isn’t over the top. While elaborate Old World kitchen designs certainly have their place, most homeowners are looking for something simpler to execute. This particular kitchen only required a few traditional accessories and design touches to give it that warm, traditional feel. The classic raised panels of the cabinet doors and drawers are first element that gives this kitchen its traditional look. The white, grey and brown hues of the granite countertops are a great complement to the off-white cabinetry and dark, hardwood floors. Corbels, crown moldings and decorative legs are simple, easy to purchase, classic accessories that help to differentiate this kitchen as traditional. The intricate chrome hardware and farmhouse-style faucets are both traditional elements that help bring this kitchen design to life. However, the most interesting part of this traditional design are the cage-style chandeliers that give this kitchen the traditional-meets-contemporary look that many of today’s homeowners are looking for. Like the previous kitchen, this one proves that a traditional kitchen does not have to be too elaborate or difficult to create. The same few elements can help to transform any simple, otherwise contemporary kitchen design into something a little more classic. For example, the granite countertop on the kitchen island has a bit of an overhang that is held up by gorgeous, large decorative legs. The bead board panel on the side of the island, as well as the farmhouse sink and farmhouse-style faucets give this kitchen design a classic, country feel. The chimney hood held up by large corbels as well as the crown moldings really help to tie the entire design together, situating it well within a traditional design style. To take your traditional white kitchen to the next level, adding just a couple of extra design elements can really help. Of course, starting with raised panel white kitchen cabinets as the foundation is key. Adding ornate, decorative fluted fillers are a small yet effective way of giving your kitchen that quintessential traditional look. When choosing your lighting, a chandelier is the classic choice. 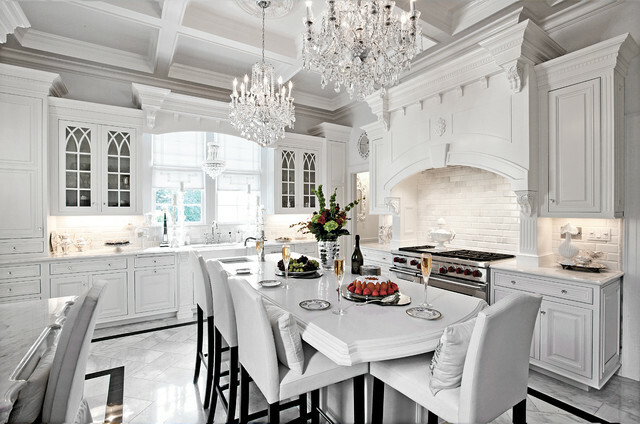 For a gorgeous complement to your white kitchen cabinets, crystal chandeliers add just the right bit of extravagance. Create a similar, classic look with our Signature Pearl white kitchen cabinets! Off-white kitchen cabinets are better if you want a kitchen with a warmer look, as true white can be somewhat bright and intimidating. Off-white hues match quite well with shades of brown, such as those that can be picked up in the granite countertop, range backsplash, rubbed bronze hardware, wrought iron chandelier and hardwood floors. These darker brown elements help to create balance in a room that could otherwise be too monochromatic. When combined with the other classic traditional elements like corbels and stacked crown moldings, you’ve created a kitchen that boasts a heavily traditional style. Of course, if you want to pull out all the stops, you can create your own little oasis of luxury right in your home. 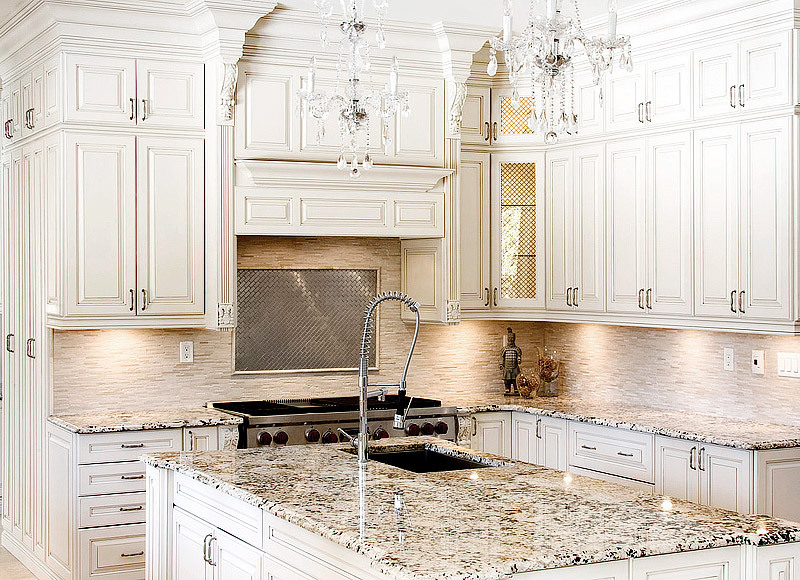 Combine all the intricate, classic elements of a traditional kitchen: raised panel white kitchen cabinets, corbels, decorative legs, fluted fillers, appliques, and other accessories with crystal chandeliers, granite or marble countertops and other decorative elements of your choice. The best part is that you don’t have to spend an arm and a leg to create a kitchen that looks expensive. You can find all of these accessories in all of our lines of stock cabinetry! We carry five styles of white kitchen cabinets, any of which can be a great foundation for your own traditional kitchen. Whether you prefer a simpler, more subdued look or a more elaborate, luxurious design, you have all the necessary parts at your disposal.